Verdi's brilliant final masterpiece Falstaff has its first new Met production in nearly 50 years, conducted by James Levine and directed by Robert Carsen. Ambrogio Maestri sings the iconic basso buffo role of Sir John Falstaff. Angela Meade is Alice Ford, one of many objects of Falstaff's affection, and Stephanie Blythe is the sharp-tongued Mistress Quickly in a cast that also includes Lisette Oropesa as Nannetta, Jennifer Johnson Cano as Meg Page, Paolo Fanale in his Met debut as Fenton, and Franco Vassallo as Ford. 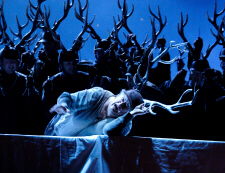 The International Herald Tribune praised Carsen's staging, first seen at the Royal Opera, Covent Garden, as a "production of eye-catching ingenuity."